Saithe stocks in Norwegian waters is generally divided into two parts, north and south of 62 ˚ N. Both stocks have remained at a relatively stable level. Sei is both pelagic and demersal, from 0 — 300 m deep. It is a schooling fish that can accumulate in large quantities where there is plenty of food. Saithe spawn along the coastal banks from Lofoten and south to the North Sea. The fry drift northwards with the coastal current and coalfish shows in the spring in southern and western Norway, and as late as August on the coast of Finnmark. Coalfish make long migrations from their feeding and breeding grounds to their spawning grounds. 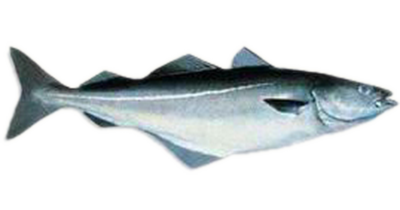 The coalfish is one of our most important commercial species. Fishing takes place in coastal waters in the north to the west of the North Cape. In the fjords and the coast of Finnmark are a significant purse seining. Otherwise, the North Sea and the banks north of western Finnmark particularly good areas. Bottom trawl, seine, purse seine, gill nets, handlines.